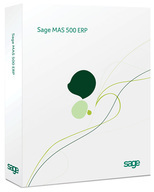 Sage 500 ERP (formerly "Sage ERP MAS 500") is a robust enterprise resource planning solution that was designed to let progressive, mid-sized businesses streamline their processes, manage business insight, and elevate productivity. Because Sage 500 ERP is built from the ground up with Microsoft SQL Server, Visual Basic, and Microsoft Office technology, this business solution features advanced customization options to meet your specific processing requirements. A complete ERP system, Sage 500 ERP integrates unmatched financial accounting software with a full-range of business solutions for inventory control, warehouse management, and manufacturing. Sage 500 ERP meets the diverse business needs and requirements of various industries, such as the Industrial, Chemical, Technology, Automotive, Packaged Goods, and Food and Beverage industries. We'll connect you with a Sage Authorized Partner who can provide more detailed information, pricing, or online demo of Sage 500 ERP.